Biography: Berenice Abbott undertook an extraordinary range of work in her remarkably productive career. She was first and foremost a photographer, best known for her portraits and documentary photographs of American life and society. But one can also think of her as an inventor, an archivist and a historian, as well as a writer and teacher. After experimenting with sculpture in her early twenties, Abbott left America for Paris where she began her photographic career in 1923 as the darkroom assistant and apprentice to Man Ray. Later she established her own portrait studio, where she photographed many of the celebrated literary and artistic figures of the day. Abbott championed "straight" photography, that is, using no special effects. She argued that, by the very nature of its realistic image, photography was documentary and, as such, found its best expression in clearly focused, highly detailed images. Abbott maintained that this relatively new art form could never grow up if it imitated other media. While in Paris Abbott became interested in the work of the French photographer Jean-Eugène-Auguste Atget. A pioneer of historic documentation, Atget devoted a large part of his life to recording the changing life and architecture of Paris through carefully composed photographs. After his death Abbott bought Atget's collection of ten thousand glass plates and prints, subsequently launching a campaign to preserve his work. Atget also provided Abbott with the inspiration for her next project: the documentation of New York in the 1930s. When she returned to New York, Abbott was struck by an environment in transition, where she observed "the present jostling with the past." Her determination to document what she saw eventually resulted in the publication Changing New York (1939), funded by the Federal Art Project. In the 1940s and 1950s Abbott turned her attention to science because, as she said, "we live in a scientific age and I thought that photography should do something about it." In 1958 she was commissioned by the Massachusetts Institute of Technology (MIT) to illustrate a series of physics textbooks. Her pictures of soap bubbles, wave patterns, bouncing balls, twirling wrenches and light beams illustrate basic mathematical principles. In many cases her images even allow abstract notions, such as averages, to be visualized. During the course of her work Abbott successfully developed new photographic techniques, as well as building and patenting several new cameras. Abbott photographed the American actress and director Eva Le Gallienne in 1927. 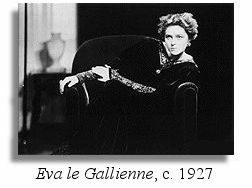 Le Gallienne not only played many of the classical roles but also made great efforts to increase the audience for serious drama. To this end she founded the Civic Repertory Theatre in 1926. Abbott never formally posed her sitters, preferring instead to convey the essence of her subjects through a telling gesture, a characteristic expression or a revealing detail of costume or accessory. Here, the dramatic slanted pose, the intense stare and the rich fabric of the dress all work to convey the theatrical personality of the actress. Museum of the City of New York exhibit, March 14-June 21, 1998. More about Changing New York 1935-1938.